EY announces Patrick Walsh of Town Sports International Holding Inc., named Entrepreneur Of The Year® 2018 Award winner in New York | Town Sports International Holdings, Inc.
Walsh joins three decades of groundbreaking entrepreneurs. NEW YORK--(BUSINESS WIRE)--Jun. 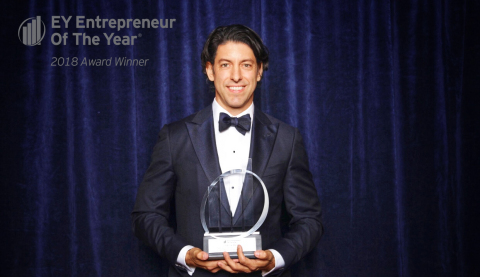 14, 2018-- EY announced that Patrick Walsh, Chairman and Chief Executive of Town Sports International Holdings Inc., (“TSI,” “Town Sports” or the “Company”) (NASDAQ:CLUB) received the Entrepreneur Of The Year® 2018 Award in the Transformational category in New York. Entrepreneur of The Year is the world’s most prestigious business award for entrepreneurs, and it’s the only competitive awards program for leaders of high-growth companies. To be eligible, nominees must be the manager or owner of a private or public company and be primarily responsible for the company’s recent performance. Walsh was selected by an independent panel of judges, and the award was presented at a special gala event at the Marriott Marquis on June 12. “I think Entrepreneurs are the lifeblood of this country and it’s great to be recognized,” said Walsh in his acceptance speech. “To all the TSI employees, you are amazing and no one can take this away from us. I’ve had the time of my life so far but I’m more excited about what we’re going to do in the years ahead." Mr. Walsh has played a major role in several turnarounds, but none have been as remarkable as Town Sports’. Walsh was faced with imminent bankruptcy in the first year he took over management of the Company. During a period when most industry expects predicted a bankruptcy or sale, Walsh vowed to TSI shareholders to turn TSI into a thriving enterprise. In 2018, the company’s stock traded over $11.00 an increase of over 1000% from a low of 92 cents in 2016. Walsh has led a strategic and calculated approach to increasing shareholder value while growing the Company’s portfolio. In just the past year, TSI has purchased Lucille Roberts, Total Woman Gym and Spa and TMPL Gym. Jeff Bezos of Amazon.com, Inc.
As a New York award winner, Walsh is now eligible for consideration for the Entrepreneur Of The Year 2018 national program. Award winners in several national categories, as well as the Entrepreneur Of The Year National Overall Award winner, will be announced at the Entrepreneur Of The Year National Awards gala in Palm Springs, California, on November 10, 2018. The awards are the culminating event of the Strategic Growth Forum™, the nation’s most prestigious gathering of high-growth, market-leading companies. In New York, sponsors also include Marsh, Empire Valuation Consultants, Kirkland & Ellis LLP, Pine Hill Group, DLA Piper and SolomonEdwards Group.